Do You Know a High School Senior? 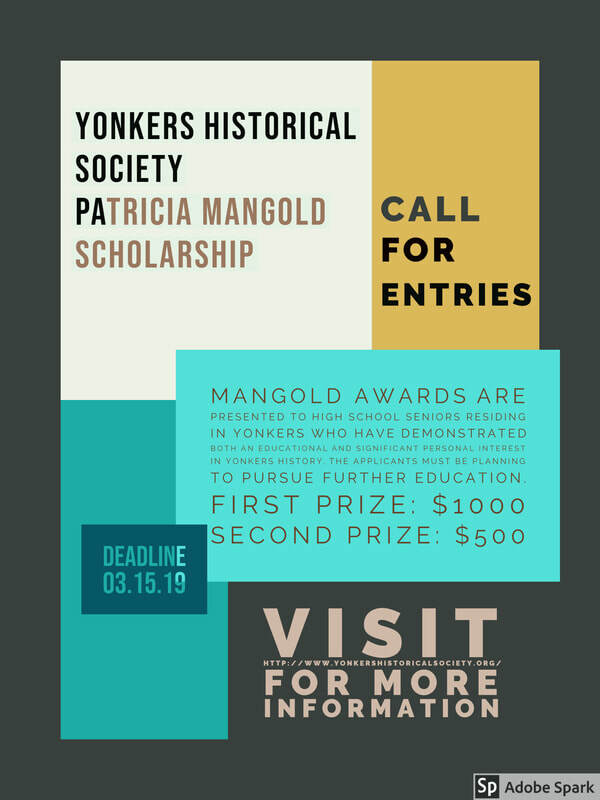 The Yonkers Historical Society has announced March 15, 2019 as the deadline for the Patricia Mangold Scholarship Awards. These awards are presented to high school seniors residing in Yonkers who have demonstrated both an educational and significant personal interest in Yonkers history. The applicants must be planning to pursue further education. First prize: $1000; second prize: $500. Applicants may mail or email (YHSawards@gmail.com) application and project postmarked no later than March 15, 2019 or may drop it off before the deadline at the YHS office in the Grinton Will Library, 1500 Central Park Ave., Yonkers, NY 10710. Call the office in advance (914-961-8940) for opening hours.